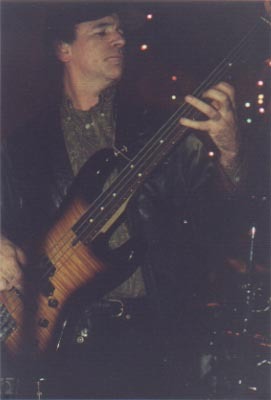 It was on the April 2000 issue of (USA) Bass Player magazine that I first read about Jack Vees. My curiosity increased as I read about a new (and already released!) CD where a four-string bass guitar was the only featured instrument! As I found out later, The Restaurant Behind The Pier was yet to be released. Having liked the CD a lot, I reviewed it and then I told myself that doing an interview with him was a good idea. Jack kindly sent me a previous solo album of his that I'd never heard before (Surf Music Again) and accepted to answer my questions. When the interview was completed Christmas was near. Alas, it was at this precise moment that my working relationship with the Italian magazine on which the interview was scheduled to appear ended. A few months later, the interview appeared on an Italian webmag whose life was all too brief. Since the present situation looks decidedly rosier, I've decided to upload the interview, which now appears in English language for the first time. Jack accepted to update the story - readers will find the new informations below, as "Postscript 2002". The first thing one notices while reading the liner notes to The Restaurant Behind The Pier is that a four-string electric bass is the only featured instrument. Some will not greet such news with joy: True, thanks to the emancipation from traditional roles and the constant evolution of both musical language and timbral exploration we now listen to solo performances from both percussion and wind instruments without batting an eyelid - which is precisely our normal reaction when it comes to pianos and guitars, instruments which in the past were regarded as more "self-sufficient" and "orchestral" in nature. But the bass?! A lot of people still consider a solo album for electric bass as a potential source of boredom due to the instrument's (supposedly) scarce timbral variety and very narrow horizons. The Restaurant Behind The Pier is the album that could make (at least some of) those people change their minds, thanks to Jack Vees's intelligent research on the instrument - which is quite often not easily recognizable, due to simple but highly ingenious treatments and "unorthodox" playing techniques - and the beauty and variety of his compositions. The instrumental cover of Jimi Hendrix's Manic Depression that opens the CD retains a lot of the punch, looseness and sense of timbral discovery that characterized the Are You Experienced? original version - a performance from which Jack Vees quotes important details from Mitch Mitchell's drum parts. Also extremely successful are the other featured covers: I Want You (She's So Heavy), the John Lennon's classic from his Beatle days, sounds extremely faithful and decidedly alien at the same time; As You Said - the Jack Bruce track from Cream's Wheels Of Fire studio LP that with its cello and acoustic guitars was in a way a preview of his solo career - receives a respectful and appropriate treatment. The picture becomes richer and even more interesting after listening to Jack's original compositions: the title-track in a way reminds me of the "percussions & koto" timbres so typical of German guitarist/luthier Hans Reichel, while John Henry pushes on the distortion pedal, Monsieur Piñata testifies of creative and inventive studio work, and the long Surf Music II explores bass harmonics via "non-conventional" techniques inside a compositional framework of great beauty and no less rigour. Jack Vees's background is very complex and multifaceted, as demonstrated by his previous solo album, Surf Music Again (CRI 1996), from the computerized piano of Piano Trio (Hulk Smash!) to the solo bass of Surf Music Again to the sequencer/cello of Rocket Baby, where the shadow of Robert Fripp briefly appears. But to me the most suggestive piece is SPNFL, which makes wise use of tiny samples from Cream's celebrated Wheels Of Fire live version of the Willie Dixon classic. On The Restaurant Behind The Pier you've included three covers of songs by three very well-known artists: Manic Depression by Jimi Hendrix, off Are You Experienced?, I Want You (She's So Heavy), a John Lennon classic off The Beatles' Abbey Road LP, and As You Said, a Jack Bruce composition from the studio LP of the Wheels Of Fire album by Cream: could you talk about the particular reasons behind your choice of these specific tracks by those artists? Well, I've always been interested in all three as pieces of music. To me they're not just tunes. Each of them takes the basic pop tune structure and puts an interesting spin on it. I Want You (She's So Heavy) comes close to having a verse/chorus structure, but the chorus ends up becoming this huge other thing, an ostinato that completely subverts the idea of verse/chorus tune structure. In the Jack Bruce piece, he is also fooling around with what we might call the bridge or "B" section of the tune (it's not really a bridge anyway). The slow ascending melodic line starts from a different pitch each time. In fact, each time it comes around, it starts from a lower note and ends on a high one. I think that makes the ascent even more dramatic. And as for the Hendrix, well he also finds a way of breaking up his choruses - not with a bridge but with that halting chromatic line. Also all three let me use the bass in ways that explore different facets of it, as opposed to relying too much on gymnastic, riff oriented playing. Actually, that was a pretty simple one! I was just scratching the strings (all four) with my fingernails and slowly opening and closing a wah wah pedal. At the time of the recording I only had a wah wah made for a regular electric guitar. So I had to use an odd EQ to bring out the "wind". Now I have a pedal made for the bass guitar so I don't have to fool with the tone settings as much. As far as adding various layers to the piece - bass line, melody, arpeggios - I mostly use a Digital Echoplex. I also have a JamMan that I'll use sometimes. I noticed that you covered what I believe to be the only Jack Bruce song for Cream where there is no bass: was it a coincidence? This sort of relates to the overall reason of why I picked the three cover versions. Also I had played cello for a few years when I was an undergraduate. I never got too serious with it, but I did learn the cello part on As You Said. As I was putting material together for this CD I remembered that I had used to play the melody, then realized if I retuned the bass I could put in other parts. A question on a more general level: on the new CD you use a solo-bass format, while on your previous CD, Surf Music Again, you've featured many different instrumental combinations. What were the main reasons for your choosing those two very different approaches? More often than not I'm writing music for other performers and ensembles (Ensemble Modern, Zeitgeist, EAR Unit, Present Music) but I've also always been active in getting my own act on the road. That doesn't always involve playing bass. I also play keyboards and guitar, as on my previous CD. Usually there is a small core group supplemented as needed. For some reason though over the past two years I began to build up this repertoire of solo bass pieces. There wasn't a set plan to make this a solo bass project, and in fact I first thought it was a pretty bizarre idea for an entire CD, but somehow it does give it a focus it might not otherwise have. It also felt like more of a compositional challenge to distil it down to just myself and see what I could come up with. Just as when I look at an ensemble as a set of possibilities, I wanted to treat my own view of the bass as a set of resources to combine in different ways rather than to play a million notes a minute. I started by using the piano resonance technique also employed in Monsieur Piñata, but then did a lot of other processing to my samples. I took about two dozen samples from the Cream's live version of Spoonful. They are all very short, only a second or two. With a large speaker in the piano with the sustain pedal down, a short loud burst of this sample would be played. I'd then record the "fallout" resonance. It is true that when Bruce's voice was in the sample you can hear an eerie "ghost" of the original. Once I had all my excerpts recorded, I went into an audio editing program (Sound Designer) and further mutated them, finally assembling them into a "tape" part that I play along with on bass. One of the funny things about SPNFL is that I never expected it to come out so dark. I usually have a pretty good sense of where a piece is heading while I'm working on it. I initially thought I was going to have a nice "warm" ambient environment, but very quickly it was apparent that the materials, the samples themselves, had this foreboding quality to them. Then I reread the lyrics and realized that was what the original piece was about, so I didn't try to steer the samples away from that. Now, as for the Rolling Stone comment, I have two responses, one on a general level and the other more specific. When the writer states "should be the bottom of the sound", he is reinforcing a conservative hierarchical paridigm. This sort of thinking is what has gotten pop/(rock) music stuck in a very tight straight jacket. One doesn't have to be as flashy as Bruce to show how the relationships in an ensemble can have many interesting manifestations. The work of Charlie Haden with Ornette Coleman's group is another good example. There was a certain kind of jazz/fusion that came about in the '70's which does emphasize breakneck tempo pyrotechniques and over busy-ness. "Finger wiggling" Jaco called it. But this material was just riff based, only faster and sometimes with odd meters. It mistook being more intricate for thinking it was actually more complex. In the better Cream improvs there is as much a high level of listening as there is of playing. My only minor criticism of the new album is the absence of "technical" information, hence this question: what's the origin of the resonances one hears on the track Monsieur Piñata? In your liner notes from the Surf Music Again CD you wrote: "I've included some general descriptions of how we put the music together, because as technology permeates more and more levels of our lives, the audience, composer and performer will probably have a better time of it if they all know what tools have shaped the process." Now, what would you say to somebody who said something along the lines of "Why should I care about this? What's important is the end result as I hear it". Well those two questions are sort of related aren't they? I do like to include technical information when there is enough space. I am more concerned with how the piece sounds and how a listener experiences it. One of the differences between live and CD though is that with "live" a listener also gets other cues, visual for one, as to how the sound is being produced. If someone just wants to listen to a recording and not be concerned with how the sound got that way, well that's fine with me. However, I also know that some people will be curious, so I let them know some of the basics when I can. With regard to the bass CD, it was just a smaller booklet insert and we decided to go with less text. Now since you asked about Monsieur Piñata I actually put my bass amp inside a grand piano! The engineer put two mics on the piano and we ran them through a compressor. The sustain pedal is down on the piano. When I played the compressor would squash the bass level down to reasonable levels, then the quiet piano resonances would be brought up when I wasn't playing. I've used this piano resonance technique in a few pieces (see SPNFL). Would you mind talking about your musical education? I know you've studied with some respected composers, Morton Subotnick and Louis Andriessen among them. I think that it would be easy to play up the "street smarts" component, but I think that especially in the U.S. too much is made of the whole "noble savage" ideal. That's a Hollywood construct. In my time in L.A., I didn't see many noble savages, but there were certainly a lot of savage nobles around! Yes, at the same time I was working on my master's degree I was playing with some of the rawest off beat groups in L.A. Check out the Ugly Janitors of America, which was John Trubee's brainchild, or the Free Bass Ensemble, an all bass guitar group (usually 12 to 20!). But those "serious" composers also made me pause and think. Andriessen took the minimalist aesthetic and knocked down some walls to let it breathe. Subotnick incorporated tech elements in a very organic way. Then there was also Vinko Globokar, who showed me a lot about underlying structure, and how to incorporate visual/theatrical elements in a way that digs deep and avoids triviality. I'm glad to have encountered all these composers. They each made me kick it up a gear and confront the issue of music making on a higher level than simple self expression. I get the meaning of "noble savage" - but what exactly do you mean by "savage nobles"? "Savage nobles" i.e. the guys who run the music business who don't know one iota about music, nor do they care to. I know you've written a book about harmonics (Book On Bass Harmonics, Alfred 1981). Would you mind talking about this? I had been playing in what was then called the "avant garde jazz ensemble" when I was in undergraduate school. The year before I enrolled, Cecil Taylor had been the director. Although he was gone by then, the new director, Joel Thome (who is known for conducting some of Zappa's orchestral works) continued the group in a similar vein. We were all encouraged to explore all of the potentials of our instruments. This sort of ensemble always attracted lots of forward thinking percussionists who would play their instruments in some very non-standard ways. Some of that I adapted to the bass, others I just stumbled across on my own. When I heard Jaco's first solo album I realized that he had found a way to take certain of these techniques - harmonics in particular - and utilize them in a more "inside" tonal format. I started to assemble a list of all the possible combinations that could be reached from any position along with footnotes for myself about the best ways to strike the strings along with other pointers. One day the guy who conducted the big band (Manny Albam, also a noted jazz orchestrator) saw my notes and made an offhand comment that I almost had a book. He suggested a couple of publishers and the second one I contacted picked it up. I remember that it took a long time for them to put it out because (this was in the days when everything was still engraved) they kept running out of the little diamond signs for harmonics! Unfortunately though still available if you can find it, it's out of print now. I'm very curious, as I bet some readers will be, to know about some of your "extended" techniques, as used, for instance, on Surf Music II. I mentioned before that I picked up a lot of ideas from watching percussionists. Also, other composers I've worked with have pushed my practice, Joel Thome and Eleanor Hovda, for instance. It seems that bowing a bass isn't all that unusual, but when I first tried it on a bass guitar, the body got in the way of course. One day I just started bowing it way up by the nut and all these great upper partials came tumbling out. I'm also intrigued by activating the strings with materials of various hardnesses - everything from rubber to glass. What would you say to somebody who considers your new CD as "a manual for bass players who like technical virtuosity" - i.e., with no real aesthetical value? I'd be very surprised if bass players would be all that interested in it - especially for technical reasons. I never thought of it as a "players" CD. Throughout a lot of it, it might not even register that one is listening to a bass album. I'm really much more interested in exploring the potential timbral palettes (that can include aesthetical beauty) and creating pieces that have some sort of solid formal (or aesthetical) foundation than trying to impress anyone with technical ability. It's much more about applying just a little imagination than what is normally given to an instrument that has so many more possibilities in it - how the acoustics and function this particular instrument works. I'll mention a few electric bass players; I'd like to know your opinion about them (and, please, feel free to add other names I haven't mentioned of musicians you consider to be important): Jack Bruce, Hugh Hopper, Jack Casady, John Entwistle, Jaco Pastorius, Colin Hodgkinson, Paul McCartney. Well, I've already talked a lot about Jack Bruce, but again I want to say that he is as important as a composer as he is as a bassist. The same goes for Mingus and Jaco. If you haven't heard Harmony Row, go get it! We did, in fact meet at a festival when he was playing with Carla Bley and I was performing on a Stockhausen piece. He's a great musician who deserves a lot more credit. Anecdote time: I met Jaco a few times, and even loaned him my amp one night. We first met when I was still in school around '77. I waited out in the snow after a concert to tell him about the bass harmonics book I was working on and also just to connect. That was in New Jersey. A few years later, probably '81, I was living in L.A. My girlfriend was waitressing at Dante's, a jazz club. She called me and said that Jaco was there and wanted to sit in but didn't have an amp. Even though he was still playing at a very high level, it was obvious he was having problems just coping. That said, we still had a very good conversation, focused and articulate about specific issues. I had the final draft of the harmonics book and we went over some details. Then he asked me if I wanted to go listen to some rough mixes (of Word of Mouth) in his car. Of course I said yes. He threw his bass over his shoulder and we went down the street. It was Winter and it does in fact rain in L.A. and it was pouring. We walked for about three blocks, and finally got to his rental car. He opened the trunk and tossed his bass in. We got in and listened to Three Views of a Secret, and part of John and Mary. What can I say? There was such brilliance there along with lapses, but we'll never see another like him. I found it funny/interesting that you also listed Entwistle. Something of my ill spent youth must be showing through! Of course, his clangey, metal sound predated a lot of other players. I'm sure that in my standard "band mode" my ideal for sound rests on the triumvirate of Bruce/Entwistle/Pastorious. I like to be able to roll my fingers over to get from the warmth to the icy clear metal of all those guys. As far as Jack Casady, I liked his playing, but didn't really pay much attention until he and Kaukonen went off to Hot Tuna. Hugh Hopper I came to much later, but I like what he does. And McCartney, hmm... It's hard to say. He almost needs a whole other article. In a way, like Bruce, brought exactly what was needed to the piece. At his best moments he knew how to activate the bottom end, not to show off, but to make the whole tune more interesting. If you really want a guilty pleasure about bassists from me, go check out Lee Dorman. He played with Iron Butterfly. Forget In a Gadda Da Vida! Anything else he played on has this wonderful baroque feel to it. He's very overlooked. But again, I'd say check out Mingus, LaFaro, Blanton, Haden and Eric Dolphy. It's not so much about the specific instrument, but how those players knew how to maintain a balance compositionally within their given ensemble. A lot of my time and energy has been directed toward the construction of the new studio spaces at Yale for the Center for Studies in Music Technology. We will be moving in there in a few months. The whole building will be equipped with the latest digital resources. Sometime next year we'll have a big "kickoff" concert, and I'll keep you posted about that. I am currently working on a piece for flute and electronics which will be premiered in March 2003 for an international flute workshop. But even sooner I will be the featured composer on New Music New Haven. That will be on Feb. 6, and I think two pieces will be performed - one for oboe and electronics, and one for handbell ensemble. I'm doing much more composing than performing right now. However, I did have an opportunity to contribute to an interesting project both as a player and arranger. For a long time - since I was a kid really - I've been a big fan of Procol Harum's music. They were one of the acts on the first rock concert I ever went to, and I was very impressed by them. The guy who runs their website got to know my work a couple of years ago. Also by coincidence, Ben Verdery is also a big Procol fan. Anyway, there is a Procol Harum tribute album in the works with people from around the world contributing versions of some of their favorite Procol tunes. Ben and I were hoping to also come up with a bass and guitar duo, but our schedules just were not working for that, so the person running this project asked if I could do one of my multi-track bass arrangements. I re-listened through their rep and settled on Repent Walpurgis, a song which concludes their first album. Musically it was challenging, especially to translate BJ Wilson's wonderful drumming into thumping and bumping etc. on the bass. But also I wanted to see if I could record mix and produce the whole thing on my laptop computer. I'm running a MacIntosh G4 titanium with the CD burner right in it. It all worked pretty well. For the tech nerds - I was running Digital Performer with their 828 box, and also utilized some "Waves" plug-ins. I'll keep you informed of new and fun developments, such as - I'm working on an opera based on The Mezzanine by Nicholson Baker - but that is going to require some time and money to get off the ground!